Valenite LLC has completed a wide-sweeping update, expansion, and improvement of its ValCOOL product line of specialty cutting fluids and coolants...introducing new formulas and blends that better meet today's machining requirements. 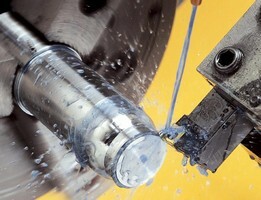 Requirements that now include ultra-fast spindle speeds, heavier depths of cut, more rapid feed rates, hardened part machining, new exotic alloys, plus environmental, inventory and disposal concerns...along with the traditional demands for longer tool life, greater output quality, and improved productivity in all machining applications. The range of ValCOOL products, combined with a broad working knowledge of both machining processes and Valenite's tooling systems expertise, provide a synergistic approach to the most challenging metalworking applications. The combination of cutting tool manufacturer and cutting fluid supplier, custom matched to the application parameters and users needs, is a unique capability of Valenite. The range of ValCOOL products include synthetic, semi-synthetic and soluble oil cutting fluids. The ValCOOL products feature benefits such as superior bio-stability, strong corrosion prevention, chlorine free options, vapor phase corrosion inhibitors, and cobalt leaching inhibitors (for carbide grinding applications). ValCOOL products can reduce machine maintenance requirements, improve tool life, produce better surface finishes, help lengthen sump life, and eliminate rancidity. Virtually all of the cutting fluid products meet specific regulatory requirements and can help to minimize rework needs and lower overall costs. Cutting fluids are available blue or undyed. ValCOOL also offers a machine cleaning solution. VAL-U-CLEAN VP is an all-purpose alkaline cleaner with a biocide for machines and sumps for fluid changeouts. It contains a corrosion inhibitor to prevent flash rust and will address all your tough cleaning needs. A wide range of additives are offered to solve multiple coolant problems, including foam depressants and non-silicone defoamers, a broad spectrum bactericide and fungicide for general duty use, industrial strength biocide to prevent fungi and bacterial growth, pH adjusting formulas, fluids to replenish cobalt corrosion inhibitors, plus biocide solutions developed for bacteria, mold, and fungi control in aqueous solutions. ValCOOL accessories include manual, automatic, economical and multi-stage drum proportioners for mixing cutting fluid concentrates with water in correct ratios, an array of skimmers in various configurations, an oxygenerator that kill anaerobic bacterial by infusing the coolant with oxygen, plus testing supplies including pH strips, an electronic pH meter, and an optical refractometer that reads and displays actual mix concentrations. Depending upon the ValCOOL product selected, coolants, additives and special fluids may be available in 5-gallon pails, 55-gallon drums, 275-gallon bulk container and a 220-gallon (265-gallon/1000 liter in Canada) disposable bulk container. As with all Valenite products, the ValCOOL coolants, specialty fluids, additives, cleaners, and accessories are backed by the company's top-rated ValProTM Customer Service for ordering,pricing and delivery scheduling, plus a technical support staff offering continuously updated product and application data, and recommendations to optimize metal cutting/coolant productivity. Valenite, headquartered in Madison Heights, Michigan with sales and service operations worldwide, is one of the largest suppliers of industrial cutting tools in the world. Besides the ValCOOL line of cutting fluids, the company offers a complete line of standard and special indexable-insert turning, milling, grooving, threading, boring and drilling products to a variety of industries. In addition, special high-production tooling for custom machining systems is produce under the MODCO name.